"All important movies start with a black screen." The Lego Movie was so successful in reinventing Batman as a comedic foil and goofy supporting character, it inspired his own feature animated spin-off. Comedy filmmakers Phil Lord and Christopher Miller return to produce the Warner Bros. Animation adapted version of the DC Comics superhero once voiced again by a very gruff Will Arnett. The Lego Batman Movie is ultimately about celebrating the Batman character and its long history in popular culture as much as it is about Danish construction toys or using your imagination. Director Chris McKay (animation co-director and editor of the original film) takes the basic premise of the Caped Crusader battling his many the villains in his rogues gallery—including the Joker voiced by a lively Zach Galifianakis—then sulking in the empty loneliness of his life and runs with it. The self-obsessed Dark Knight becomes more and more sullen before struggling to embrace the idea of partnership and finding his own family to fight crime. Michael Cera with his gold-shimmering cape and boy shorts provides a sparkling turn as sidekick Robin who acts as Batman's main comedic target. His emphasis on (boy) wonder, innocence, and excitement is a humorous treat as he delivers every line with a positive earnestness. Ralph Fiennes seems like he was born to voice of Alfred the butler balancing a fatherly stoic tone with a naturally dry gravitas. Rosario Dawson as Barbara Gordon/Batgirl manages to ground the fantastical film and move its basic plot along with reiterating the ridiculous nature of Arnett's vocal performance. The crux of the film centres on how many is able to defeat not only his villains but all villains without any help. He and the Joker's conflict revolves around Batman being unable to accept their antagonistic relationship or his need for anyone. While the animated feature has an undeniable sense of fun and excitement, the constant visual imagery, sight gags, and inside jokes can get exhausting. However, the relentless pace allows for enough knowing self-awareness to balance the bombardment of cinematic theatrics. It's a densely packed comedy adventure full of self-deprecating jokes at every turn. 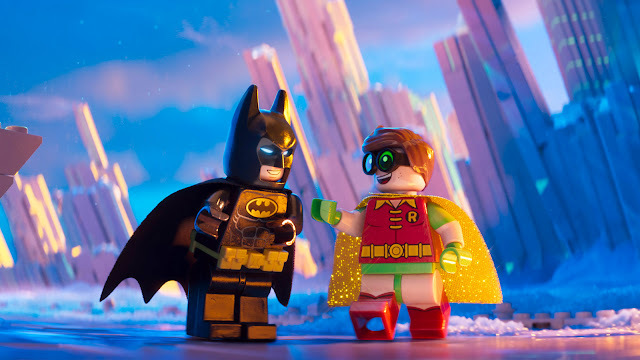 Lego Batman mostly sparkles as a fun and bright Batman adaptation full of jokes celebrating the long, storied, and ridiculous cinematic history of the DC Comics hero. Arnett, McKay, and the movie's five credited screenwriters mock and exaggerate the dark, brooding nature of the character while embracing what has made him so popular.